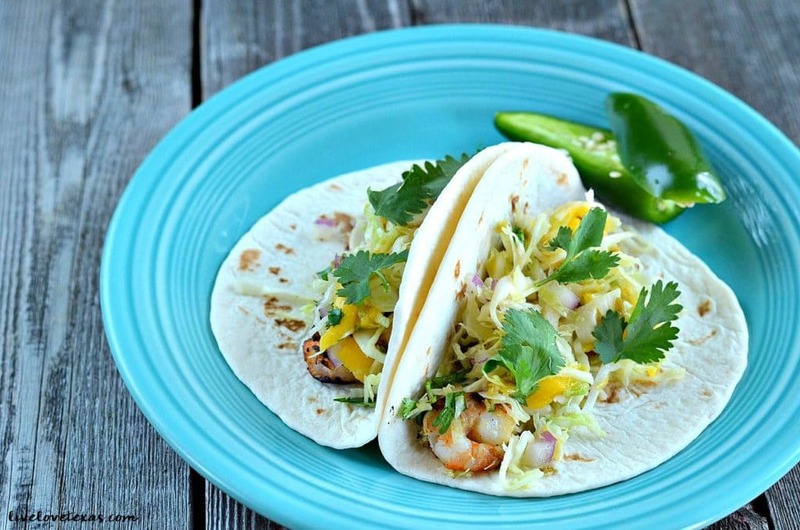 This grilled shrimp tacos with jalapeno mango slaw recipe is fresh, flavorful, with just a touch of heat. This is a partnered post on behalf of McCormick. As always, all opinions and experiences are entirely my own. Predictably for dinner every Tuesday night we used to eat tacos for dinner. Taco Tuesday – that’s catchy and memorable right? There was never a question about what to thaw for dinner or a debate over who would cook because we knew. Tacos are a family favorite and preparing them are so easy that it didn’t matter who prepared them, as long as that’s what was for dinner. And if we know we’re having expecting guests, tacos are a great meal that’s crowd-pleasing and quick to make. Even for picky eaters, tacos can be prepared in so many different ways that there’s something for everyone. Now you might think that living in Texas, I’d quickly tire of all the Mexican food but I feel quite the opposite. I love being surrounded by so many restaurants offering creative variations on traditional dishes, there’s something new to try at every turn. So this week, after receiving a box of spices and recipes from McCormick, I decided I didn’t need to dine out to have a different style of tacos. 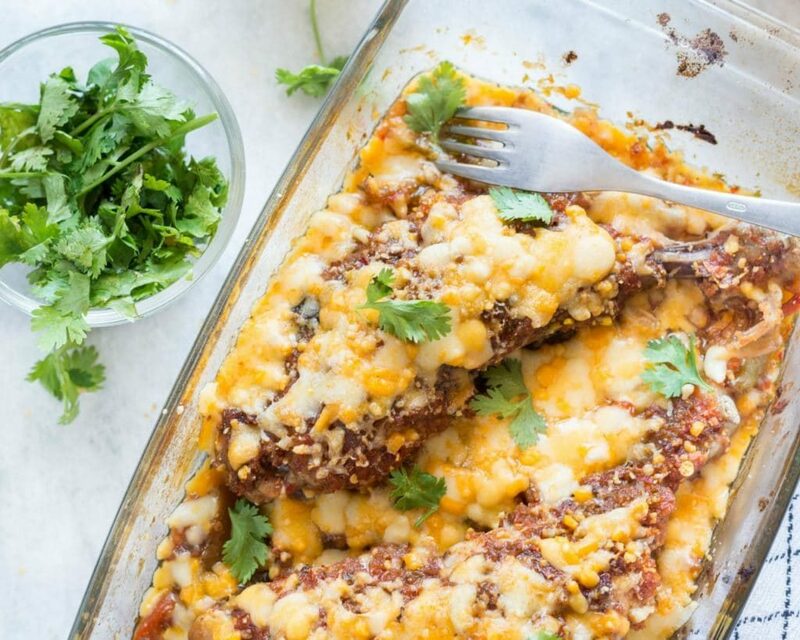 There were so many delicious recipes, I decided to change things up at home and instead of making our usual crispy beef tacos, try something new. 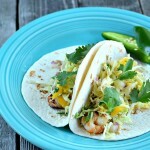 We prepared Grilled Shrimp Tacos with Jalapeño Mango Slaw and they were so light, yet filling. My husband is a grill master so this dish ended up being a team effort with him taking care of marinating and grilling the shrimp and me preparing the slaw. We both loved the delicate balance of sweet and spicy and the crunch the slaw gave to the tacos. With the grilled shrimp and fresh flavors, this recipe is perfect for summer. This is what you will need from the store before you fire up the grill. The first step to perfectly grilled shrimp is to let them marinate. Grilling marinated shrimp leaves them crispy and juicy all at the same time. Then, put the shrimp on a kabob skewer. They only need to be on the grill for about 2-3 minutes per side. You will know they are done when they turn pink. Not a fan of mango slaw? Here are some other toppings that bring out the flavor of the grilled shrimp. Here is the printable recipe card. Don’t forget to pin this post so you can have it later! Mix oil, lime juice, cilantro, jalapeño peppers, honey, garlic powder, and salt in small bowl with wire whisk. Reserve 1/4 of the marinade. Pour remaining marinade into large repealable bag. Add shrimp; turn to coat well. Refrigerate 15 minutes. Meanwhile, mix cabbage, mango, and onion in large bowl. Add reserved marinade; toss to coat. Cover. Refrigerate until ready to serve. Brush 1 side of each tortilla with oil. Grill, oil-side down, over medium heat 2 to 4 minutes or until lightly browned. Remove tortillas; cover with towel to keep warm. Remove shrimp from marinade. Discard and remaining marinade. Grill shrimp over medium heat 2 to 3 minutes per side or until shrimp turn pink. To serve, place 3 shrimp on each tortilla. Top with slaw and serve immediately. Make sure to pin these Shrimp Tacos for later! What’s your favorite Mexican dish? 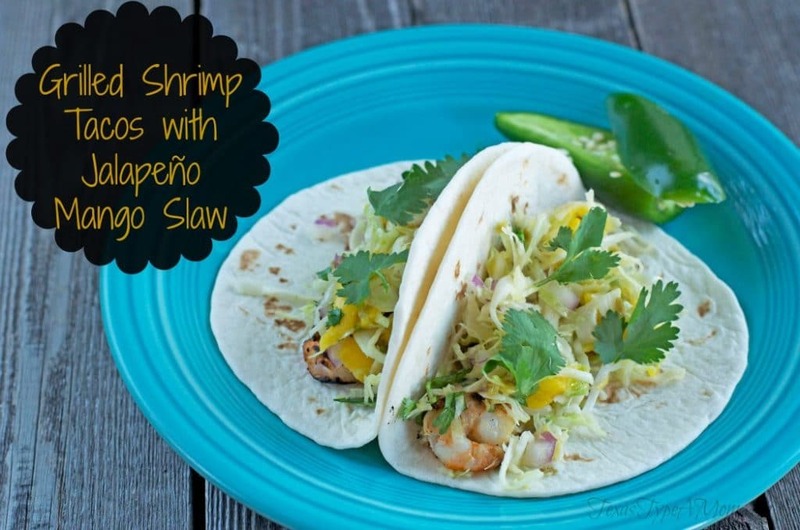 If you enjoyed this grilled shrimp tacos recipe, you might like these other recipes too! We don’t eat seafood, but I bet chicken would substitute in there nicely! We love Mexican food but I have never tried a shrimp taco. That looks really good! I have never tried Shrimp Tacos! These look great, I’m going to have to try them. I have been all about fish tacos lately and go to one of my favorite restaurants to get them. But these look delicious and I think I could actually give them a try at home! I don’t eat shrimp but I think this McMormick seasoning would be great on our vegetarian chicken. I love tacos! Thanks for sharing. 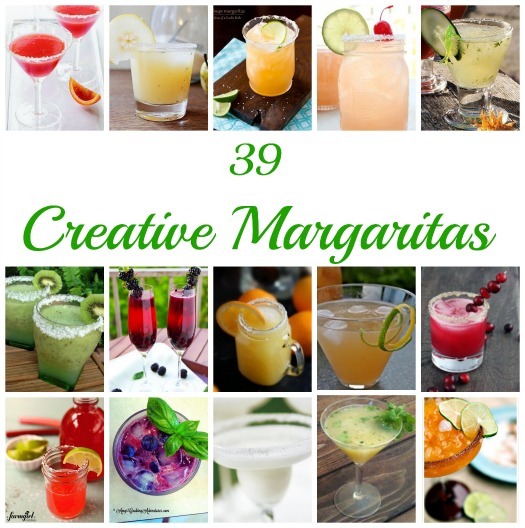 Great photos and great recipe post! This sounds good, I like the idea of changing the coleslaw up with mangoes. YUM! I’ve gotta try these! I never get tired of tacos either…I’ve had a hard time going gluten-free because of this love! Have you had the fish tacos at Z-tejas? Sooo good! I do believe I will be steeling your Tuesday Taco tradition and I can’t wait to try this recipe! I don’t eat seafood but my husband would love those! I bet these are really good. I like the idea of using shrimp. girl those look so good! We just did steak, chicken, and pineapple kabobs last night. oh yum, those look awesome! Yum, those tacos look delicious! The jalapeno mango slaw looks delicious. As does it all! That shrimp looks delish! 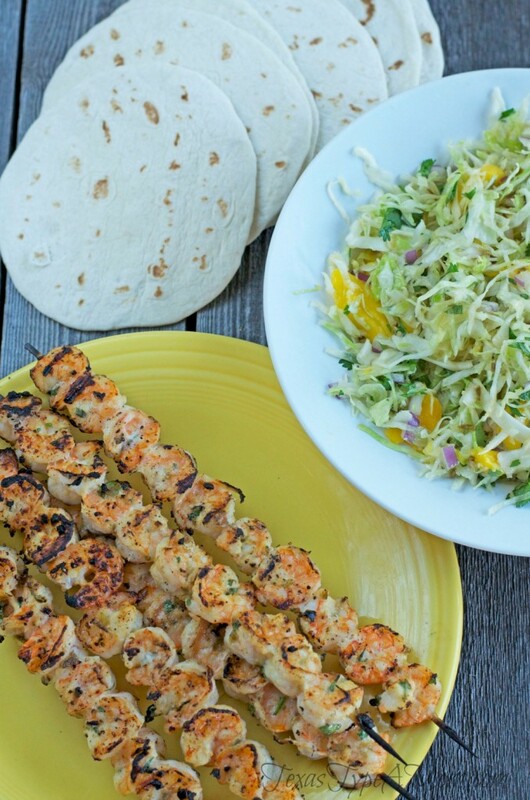 Perfect summer food — I’d love to try this in a shrimp taco salad! Oh my yum! Perfect for summer! These sound totally awesome! Thanks for sharing. Omgosh Kelly, these look divine!!!! Now THAT is something my husband would LOVE! (Though, he isn’t a very good griller!) Thanks! My new house has a mango tree in front and I am definitely making this. Saving for later on pinterest! Wow, this looks so yummy, I never had jalapeno mango slaw before but I would love to make it and try this recipe. I think it would be a hit around here! Oh my goodness..this sounds soooo tasty! It’s hard for us to find good jalapenos, but worth it for something so tasty. Ok I am seriously going to have to try this. My daughter and I love shrimp! Yum! This looks delicious! I’ll have to try this for my family. They would love it! Mmmm, this looks really good!